Well, you guessed it right, this post is dedicated to all that information, you will need to get started with the WordPress. You may have read and heard a lot about the importance of online presence. As well as, how cool is building, maintaining and running a CMS (Content Management System) based website. Yes, that’s quite right, it’s cool – especially with the WordPress. WordPress ….. well that’s lot of WordPress, WordPress…!! Believe me – it’s not magic! Installing and setting up a WordPress website is as easy as you say cool. It does not take much. You can install it on your computer without having and knowing a lot about the Software Engineering or Coding. All you need a couple of pre-developed software (WordPress included). So, let’s get straight to the point. That’s too much? No, literally no. Luckily some nicest people out there have taken all the worries and have developed the coolest things. We call these XAMPP, MAMP and WAMP (not a vampire thingy). If you are a Windows user, either of these is good for you – but only one of these. While, if Mac is your thing (like me), XAMPP or MAMP is the right choice. For Linux users, XAMPP is to consider (seriously? if you dare to use Linux, you ‘ll not be reading this or Linux isn’t for you). Anyhow, all these come with Apache (web server), MySQL (database server) and PHP. All you need to download and install on your computer. You don’t need to worry about anything technical or advanced configurations. Everything comes pre-configured and ready to run. And of course, you can learn more details on their respective websites (always encouraged – but you can skip for now). Follow the setup wizard carefully and take notes of these important stuff. You may need some of these later on. AGAIN!!! Take note of the folder where it configured your website folders. Usually, it is a folder within the installation folder of the software, unless you specifically entered a different location during the setup. On a Windows computer, it is usually “www” for WAMP and “htdocs” for XAMPP. While, on a Mac or Linux this could be under your user’s home folder. Normally at end of installation, the setup wizard runs all necessary servers for you. You can check this by visiting http://localhost in your web browser. If you see a page about your recently installed Web Server, then you are good. Otherwise, you need to click (or run) the software by approaching it’s executable (i.e. double clicking the software icon in your computer). It may take a few seconds to bring up it’s Control Panel screen and necessary servers. Check again by visiting http://localhost to confirm if it’s running now. 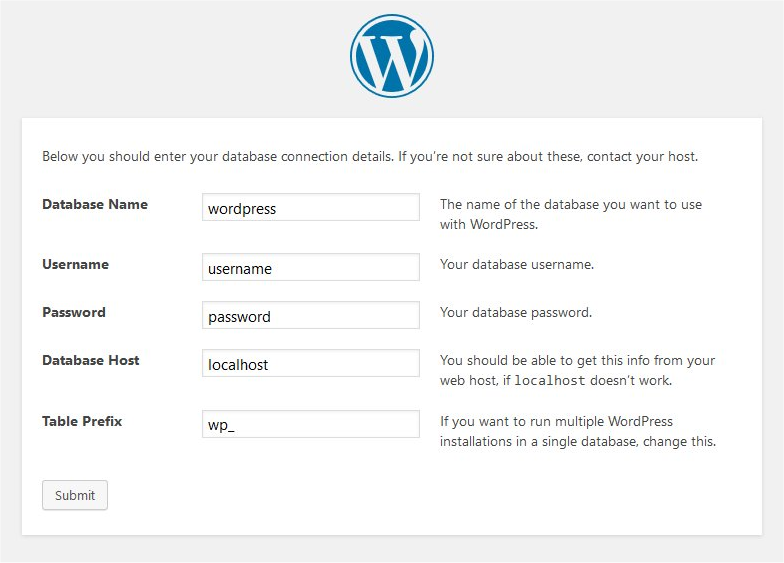 Alright, your upcoming WordPress installation needs a database. So it can store your posts, pages, user stuff and all the configurations of your website. 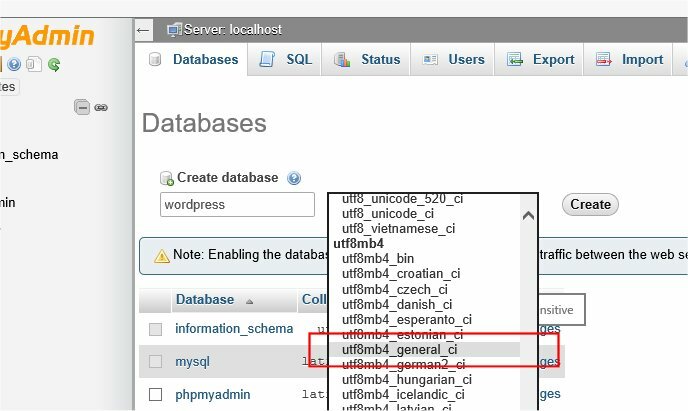 Since you have installed Web and Database servers using XAMPP, MAMP or WAMP, you may have got a database client software already. The database client software is an easy-to-use graphical interface, to interact with your databases. You can create, edit and delete a database via this client. The software you recently installed, comes with phpMyAdmin database client. Normally you can access it via the Control Panel of the software, or may find the link on Web Server’s default page (i.e. http://localhost). As another approach, you can visit http://localhost/pma/ or http://localhost/phpmyadmin/, based on the software you used. If none of these work, not to worry. Simply download latest version of phpMyAdmin and unzip in a folder, under your web folder. You can name that folder anything meaningful, easy to remember and access it whenever needed. After unzipping, you can access it via your web browser (like mentioned above). Ignore that long list of items in dropdown menu, just click “Create” button after entering a database name. If all goes well, you are done here. If you are done with the previous, you are pretty much done. Now just a little step and you’re all done (ufff, so much done done). Well, go straight to the WordPress.org website and click that blue button on right side of the page, to grab a copy of WordPress. Simply unzip it in your web folder (noted previously). You can create a new folder under your web folder to unzip WordPress in it. This is a good practice if you want to run multiple WordPress installations. After unzipping in your desired location, fire up your favourite web browser and visit http://localhost/wp-admin/install.php in the address bar. If you unzipped in another folder, remember to append the name of the folder with the address. For example, if you unzipped in “mysite” folder, then you should visit http://localhost/mysite/wp-admin/install.php to bring the WordPress installation page up. You should see the famous-shiny 5 minutes setup screen of WordPress. Well, actually it takes less than that. It’s a series of a few simple forms – just fill-in and keep progressing. Enter the details in the relevant boxes and click “Submit” button. If all goes well, you’ll be asked for some basic but necessary information about your new website. Enter the details carefully and remember the Username and Password. You will need these to enter in the administration section (a.k.a. WP Admin or Dashboard or Backend) of your website. Are we ready yet or not? Of course, your site is ready, if everything is fine past this point. 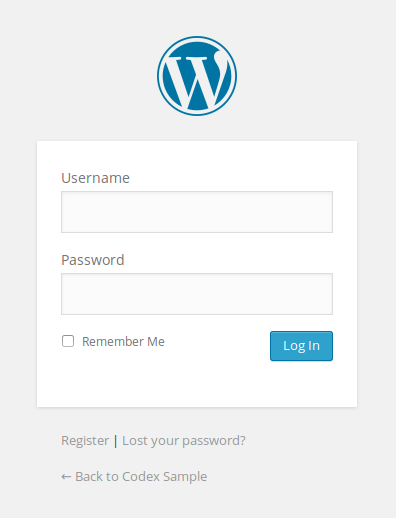 In previous step, if your installation went well, WordPress will take you to the login screen of your site’s Dashboard (or admin panel). Go ahead and login by entering the Username and Password. These are the same you created during WordPress installation previously. On the other hand, you can access the backend (admin panel) by appending “/wp-admin” in your site’s URL (i.e. http://localhost/mysite/wp-admin) and you can see the frontend (front face of website) by visiting the URL without /wp-admin (i.e. http://localhost/mysite). Ok, you’re done with the most difficult starting point. 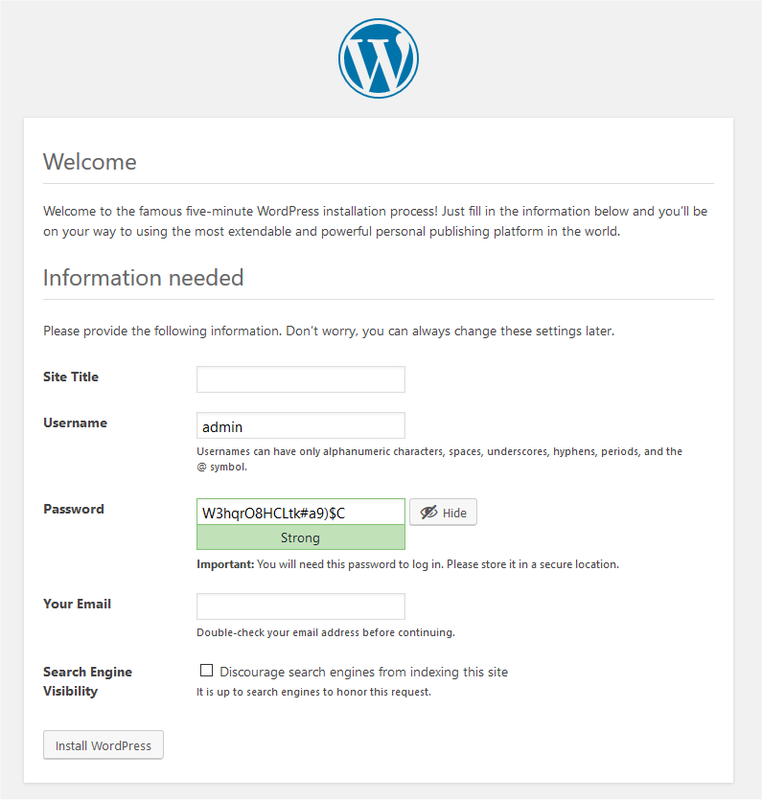 Now you need to get used to with the world of WordPress. As a beginner or first-timer, you’ll merely go through the Web Server and Database Servers stuff again. But you need to learn and understand basics of WordPress itself. Themes: Click “Appearance” menu to see the installed themes. Under each pre-installed theme, find the “Activate” button to make it the current face of your website. You can activate one theme at a time. Activating another theme, will deactivate the previously activated theme. There’s an “Add New” button, where you can find hundreds of new themes. Plugins: Look for “Plugins” menu and click to see a list of pre-installed plugins. Same as themes, you can activate a plugin. But unlike themes, you can activate all of them. A plugin is a piece of code, which adds more features to your WordPress website. There’s also an “Add New” button. Click it find tons of great stuff.